Lightning McQueen’s Canadian Road Trip is officially in Toronto this weekend. Fans of Disney·Pixar’s beloved "Cars" franchise have an opportunity to see a life-size lookalike of the five-time Piston-Cup champion. 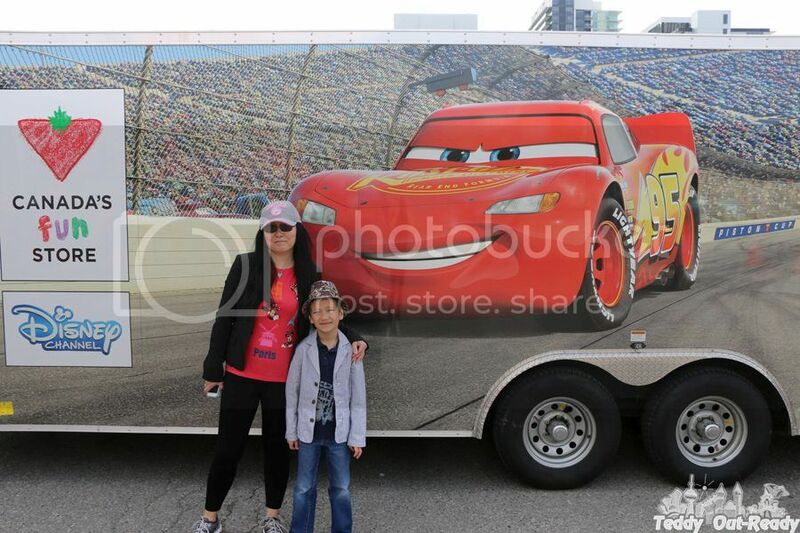 Lightning McQueen’s Canadian Road Trip Turbo Charged by Canadian Tire already visited Vancouver, Calgary, Edmonton, Winnipeg and continue hits the road making pit stops at eight cities across Canada in total. The cross-country tour started in Vancouver on April 29th and wraps up in Halifax on June 17th, all in celebration of the release of Disney·Pixar’s new movie "Cars 3" on June 16. 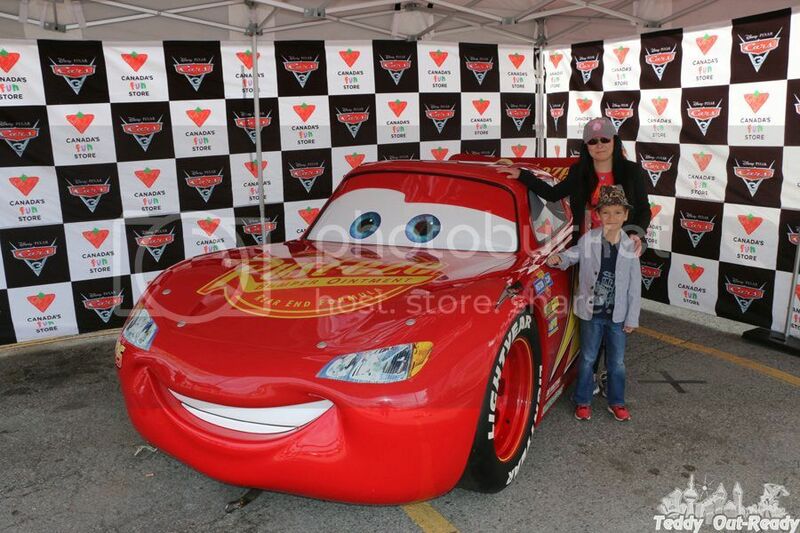 Throughout the road trip, Lightning McQueen’s life-size replica stationed at select Canadian Tire locations in Vancouver, Calgary, Edmonton, Winnipeg, Toronto(this weekend) and heading to Ottawa, Montreal and Halifax. At each location, racing fans have the chance to have their photo taken with the life-size character car, plus test their motor skills at a remote control racecar track. In addition, Disney Channel will be hosting a Kids’ Activity Pit Stop area with free "Cars 3" arts and crafts for visitors. We had a chance to visit first Toronto stop of the tours, a life-size Lightning McQueen is amazing. Cars movie fans gather long before the opening to take photos with Lightning McQueen. National tour will cross the finish line in Halifax on the opening weekend of Disney·Pixar’s “Cars 3”. Blindsided by a new generation of blazing-fast racers, the legendary Lightning McQueen (voice of Owen Wilson) is suddenly pushed out of the sport he loves. To get back in the game, he will need the help of an eager young race technician, Cruz Ramirez (voice of Cristela Alonzo), with her own plan to win, plus inspiration from the late Fabulous Hudson Hornet and a few unexpected turns. Proving that #95 isn’t through yet will test the heart of a champion on Piston Cup Racing’s biggest stage! Directed by Brian Fee (storyboard artist “Cars,” “Cars 2“), produced by Kevin Reher (“A Bug’s Life,” “La Luna” short) and co-produced by Andrea Warren (“LAVA” short), “Cars 3” cruises into theatres on June 16, 2017. There is going to be a lot of happy kids, your son looks so happy and excited on the way out to meet Lightning McQueen!! Glad you guys had an awesome time, love the pictures and the video!! Thank you, Lynda! It was fun event!